06/04/2013 UPDATE: the Windows version of Ohm Studio now comes with an "Uninstaller" program. 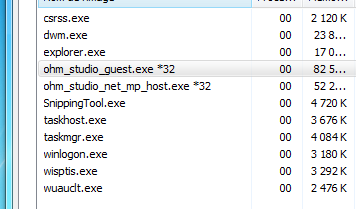 See if ohm_studio_net_mp_host.exe and ohm_studio_guest.exe are present in the Process list. If necessary, select each process and "kill" them by clicking on the End Process button. If you only wish to "reset" Ohm Studio, step 4 and step 5 should be enough. Note that this folder contains a sub-folder named Samples which itself contains all the audio files used in your Ohm Studio projects. If you wish to re-install Ohm Studio later, you can keep this Samples folder so that you don't have to download all these audio files again next time you open your projects inside Ohm Studio. If you changed the default location of your My Documents folder to another folder (e.g. on another hard drive), you will find the cache folder there. Am I supposed to uninstall my old, crappy Ohm Studio each time before updating to the newer, awesomer version? Or is this only for those few strange people who actually want to uninstall Ohm Studio? Sorry if this has already been answered elsewhere. hi artlegere and sorry for the confusion. No, you don't have to uninstall the Ohm Studio before installing a new version (it is done automatically). This topic is intended for people who would like to erase everything installed by Ohm Studio. Sometimes, it can also be useful to manually clean your preferences to "reset" the Ohm Studio, or to clean the Cache folder to free up space on your hard drive. On Windows, you can just delete "ptaf-cache" and "wrapvst-cache" from ...My DocumentsOhm ForceOhm Studio to force a rescan of your VST folder(s) or to resolve problems with opening Ohm Studio. The discussion title was updated as multiple testimony showed that uninstalling the application and then re-installing it can solve problems related to the loading / scanning process. This path does not seem to be there on Windows 7. Unless you have changed the path to your "My document" folder of course. You mention in another post that your "My Documents" library location is on a network share. That's probably not a good idea for OhmStudio, as it cache data onto that location for use during the session, so it's likely to slow you down and, as Windows' network handling is pretty dire, could cause serious blockages, particularly given that your network will also be in use for collaboration. I agree with the disrespectful way the installation is handled. I tend to hate software that is provided with a propriety installer that i can not check what installs where. I also hate folders in wrong places. Why on earth would "Gforce" folder reside inside my /Library/ folder (MacOS) ? There is an Application Support folder for that purpose. At least provide us with a clean uninstall option soon. Or post here every file ohmstudio creates or whatever.. I'm starting to get very feed up with it not working and leaving crap all over my nice clean PC. Please delete this account. The software did not work. Also, I agree that an uninstaller-type program would be efficient. However, given what I know now, I can understand the lack of uninstaller-type program. I think that Ohm Studio just binds some complacent musicians. I don't like software that comes up in a forum with a huge Google Chrome Installer frame which is hard to close. And I don't like software which produces uncontrolled and unwanted internet traffic. And I don't like software which produces uncontrolled and unwanted internet traffic. It is certainly an alternative between usability and protection of ? "privacy": Anyway, I do not think ohm studio sends all your private files to the CIA. And generally, as it intended to collaborative purpose, ohm studio facilitates wide collaborations. We only do music and ohm studio makes it more collective (this is the root of music, no?). I have asked the administrator to delete your account. Thank you for trying. I don't like software that comes up in a forum with a huge Google Chrome Installer frame which is hard to close. You should only be asked to install Chrome Frame if your browser is not up to date. It is a better alternative than asking people to pay a tax right? I have downloaded the program three times and also uninstalled it three times. When I come to launch the Ohm Studio it just will not connect to the server. I get a message that says Cannot connect server not reachable. Apart from the obvious have you tried to switch off the "firewall" in PC or in router to "rule that out" and please put them back on after testing, don't want to make more problems. I could not get it to work for ages because of an VST issue which kind of sorted it's self out. Don't give up it is BETA so let it go wrong and tell them. ...And if all else fails, post the log files (using the reporter tool, if it'll work). ohm_studio_guest.exe and ohm_studio_net_mp_host.exe need to be allowed through your firewall but even when allowed on some firewalls it may still block through put. If you can't connect or you connect but tracks seem to keep downloading but not get anywhere, or you join a project then you see someone's track being sent to you but it hangs, then try turning off the firewall, rejoin the room then let it receive proper then on the firewall again. For windows if you allowed the ohm_studio_net_mp_host.exe but seem to still have problems then manually add the file to the firewalls allow list, this will be the default path. Also allow this file too so when you crash bugs are reported properly to ohm force. we have started working on an uninstaller program on Mac and hopefully an uninstaller for Windows will follow. On a Mac, once we delete the folders/files you mentioned, will that completely remove Ohmstudio from my Mac? I just want to rescan my plugins. Is this the way to go still? Changing the VST path directory in the preferences menu should also trigger a re-scan next time you launch Ohm Studio. What does Rep mean and where is it? Unfortunately that didn't work. I deleted my VST path (and choose a similar path: 'components' on Mac), closed and opened OhmStudio, then opened again and it didn't change anything.Same VSTs still show with no new ones. Soundtoys just won't show. I've bought a few other plugins recently and they show no problem after I loaded then up on my Macbook. There must be an issue with Soundtoys products. So, sorry to say, that Ohmstudio seems not to work with my audiophile soundcard and win 7 64 system. Probably i keep this account only to the end of this month as i donÂ´ t see any solution. Fyi, Soundtoys showed up on the scanned plugin list all of a sudden. I didn't even do anything. Just one random day I went into Ohm Studio and Soundtoys were scanned and I can now use them. I'm guessing the guys at Ohm addressed this in an update. Glad to be using Soundtoys again. We are aware of sound card related problems with Ohm Studio. Ideally we'd need the same hardware in order to reproduce and fix these problems but of course that's not possible most of the time. The next update will focus on improving Ohm Studio's automatic crash report system on Windows. This won't solve your problem right away but will give us more information and hopefully will help us find a solution before the end of the beta testing period. UPDATE: the Windows version of Ohm Studio now comes with an "Uninstaller" program. yeah i found this to be very handy way to do it. good job team ohm. Hello I am new to this program and beyond anxious to get it going! I signed up for an account and it said to wait for an email. Well it has been 24 hours so far with no email. I checked my inboxes and spam folders... After waiting a while for an email, I assumed was going to show up within a few minutes, I ended up making another account with another email to try and see if that worked. No luck, same result... Do I have to cancel my accounts and start new ones or what? Hopefully email registration has been restored. so ohmstudio is still alive... i got a confirmation email finally! Very nice. Great discussion. Thanks to everyone. If you are looking for the best deals and offers on flight booking. I suggest, visit American Airlines Phone Number, this is good at services and price. Thanks for Writing informative discussion. At 24x7assignmenthelp.com you can get all your assignment help at reasonable costs. Our company strives to excel in the academic domain so that the best can be provided. We also provide other services like editing information or graphical representation of data. It is our solemn duty to work for the student's needs and wants and strive them towards academic excellence. Here you will find your Thermodynamics Homework Help.